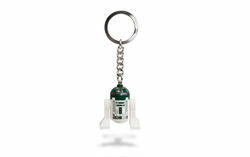 852946 Star Wars R4-P44 Key Chain is a Star Wars-themed Key Chain set released in 2010. It features an R4-P44 minifigure with a metal chain and key ring attached to the figure. This is a description taken from LEGO.com. Please do not modify it. (visit this item's product page) R4-P44™ guards your keys! Authentic LEGO® Star Wars™ R4-P44™ minifigure attached to a sturdy metal chain and loop. R4-P44 was previously only available with the set 8088 ARC-170 Starfighter. Facts about "852946 R4-P44 Key Chain"
ShopDescription R4-P44™ guards your keys! This page was last edited on 10 January 2016, at 00:02.